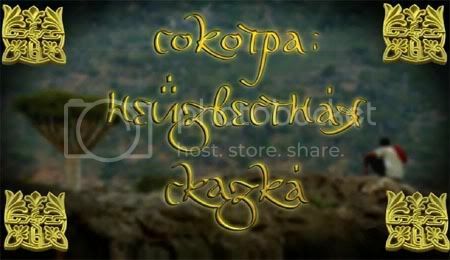 The film tells the story of daily life and heritage of Socotran hermits, of the tale of "Two Brothers" from the library of Pharaoh Seti, which is told to Socotran children at night, of incense of Socotra, its exotics and much more. It presents the most authoritative expert opinions of leading Russian experts on Socotra, the recent sensational discovery of Socotra's "Oldowan Mariners' culture" more than 1.5 million years ago. The film sounds a real live speech Socotrans, Socotran folklore. - Vitaly V. Naumkin - Doctor of History, Director of the Institute of Oriental Studies, the author of books on Socotra,- Alexander Vs. Sedov - Doctor of History, Director General of the State Museum of Oriental Art, Head of the Russian- Yemeni Integrated Expedition,- Khazri A. Amirkhanov - Corresponding Member of RAN, Head of Department of the Stone Age of the Institute of Archeology of the Russian Academy of Sciences. The writer of these lines, who has recorded on tape by accident a Socotran tale of "Two Brothers" in 1979 and is an author of a scientific publication of this tale original version in Soqotri in the CLN Journal, also shares his views on several specific issues of the old Socotran times.